Welcome to the ninety-ninth of my blog interviews with novelists, poets, short story authors, bloggers, autobiographers and more. Today’s is with mystery author and former Professor of Psychology Lesley Diehl. If you like what you read, please do go and investigate the author further. A list of interviewees (blogged and scheduled) can be found here. Morgen: Hello, Lesley. Please tell us something about yourself and how you came to be a writer. Lesley: I was raised on a dairy farm in northern Illinois, an only child, and a girl to boot! The other farmers around and the family up the road from me who had six children looked at my only status with suspicion. Looking back, I now know my parents were practicing birth control! Alone, wandering the fields or in the barns, I talked to myself a lot (I still do it although now I have a husband and two cats and they sometimes pay attention to me especially when I offer food), and made up stories. You know the ones—I’m really a princess but I’ve been kidnapped by these poor people who make me work for my allowance. I need to find my way back to the palace. Help! Anyway, I wrote down some of them when I got older. I made up poetry as a preteen and I even composed operas which I sang to myself when I took a bath. I can’t even read music. My English teacher in high school and another in college encouraged me, and I got a short bit published in the literary magazine in college. Then I went to graduate school, learned how to write scientific articles and ruined my literary creativity all in the name of a steady job. Morgen: But you’re back again. What a wonderful life, if not a hard one. Mine’s very simple: parents, sibling, normal house – nothing particularly autobiography-inspiring, and I thought I’d have nothing really to write about but I have a great imagination, which is all it takes. Oh look there’s a tank rolling through my garden. 🙂 What genre do you generally write and have you considered other genres? Lesley: I always read mysteries, began as did others with Nancy Drew and graduated in high school to Agatha Christie. I liked the challenge of solving the mystery, loved the lure of the English country village so unlike the small town I was from where people disliked and even hated one another, but never did anything as adventurous as killing each other. So I write mysteries because I like the view of the world the mystery writer and the mystery reader share. Both believe the bad guys will be found out. How optimistic! Morgen: And really they have to be in fiction but how you get the story told which grips the readers. What have you had published to-date? If applicable, can you remember where you saw your first books on the shelves? Lesley: I have several books out. The first was A Deadly Draught from Mainly Murder Press. It was great fun researching it because I came to know many microbrewers. They not only let me sample their beers, but they answered all my questions. The book features a woman microbrewer and it is set in upstate New York in the valley in which I live half the year. I’ve just signed the contract for the second in this series, tentatively entitled Poisoned Pairings. It focuses on pairing food and beer and, of course, murder. The second book is Dumpster Dying. This one, published by Oak Tree Press, has a rural Florida setting and a retired preschool teacher turned bartender as the protagonist. My aunt was a bartender, so the gene runs in the family. The other book is an ebook (both of the above are available on Nook and Kindle) from UntreedReads. It should be out later this year. 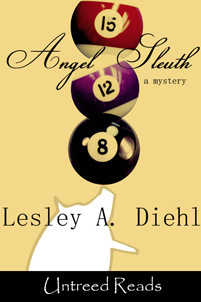 Look for it as Angel Sleuth in case you’re wondering if guardian angels make good detectives. I have a number of short stories out with Untreedreads, an epublisher. I remember seeing my first book in a bookstore near me. I was so shocked, I wanted to buy a copy. Morgen: And you resisted? 🙂 The first time I saw myself in print was in a Woman’s Weekly Fiction Special and I bought three copies… for myself, my mum and my aunt, then I went back and bought some more for friends. 🙂 How much of the marketing do you do for your published works or indeed for yourself as a ‘brand’? Lesley: Like other authors with small presses and perhaps all authors period, I spend way too much time promoting myself and my books. I’d prefer writing, but I want people to read my books and the only way they’re going to find out about the books is if I do the work. Although my publishers do marketing also. Morgen: I’m the same with this blog vs writing but for me it’s audience-building and I am enjoying myself, which is what it’s all about. Have you won or been shortlisted in any competitions and do you think they help with a writer’s success? Lesley: In 2010, I won the short story contest at MWA Florida Chapter’s Sleuthfest conference, one of the best-known conferences in mystery writing in the US. My career in writing took off after that. I must have placated some writing gods somewhere with that win. Morgen: Judges = gods, yes I’d say that’s about right. 🙂 Do you have an agent? Do you think they’re vital to an author’s success? Lesley: I recently signed with an agent to represent one of my manuscripts. I did it to obtain entre into larger publishing houses. We’ll see if it works. I have a stuffed likeness of my agent and a shrine where I present chocolates and champagne weekly, but I don’t think she’s interested because I find them untouched. Her loss. I eat them myself. Morgen: I like that image, maybe a plot for one of your forthcoming books? 🙂 You’ve mentioned eBooks earlier, are all your books available as eBooks? If so what was your experience of that process? And do you read eBooks? Lesley: The man in my life to whom I refer as “my cowboy” bought me a Kindle for my birthday. I love it for many reasons, but mostly because it’s easier to hold it when I read in bed because I have carpel tunnel. All my books are available as ebooks. I retained the erights to A Deadly Draught and had someone convert it for me for me as I had no time to do it myself. My publisher issued Dumpster Dying in both trade paperback and ebook. Morgen: A fairly smooth road then by the sound of it. What was your first acceptance and is being accepted still a thrill? Lesley: The short story win at Sleuthfest was the first confirmation I had that my writing shouldn’t be taken out wrapped around the garbage. Actually, I’m on a daily thrill high at being a writer. Morgen: Me too, although I’m way behind you. Have you had any rejections? If so, how do you deal with them? Lesley: I’ve had about the same number as every other writer in this business. Morgen: Probably not me, I’ve only had 27 (or is it 29?). Lesley: I’m always surprised that agents and publishers take the chance of rejecting writers who spend their days plotting murders, but with the speed the rejections appear (ten seconds between receiving the emailed query letter with accompanying 50 pages and rejection) I strongly suspect no one’s reading the stuff anyway. So let the agents and publishers remain sublimely unaware of the dangerous waters in which they swim. Morgen: Some places ask for the first three chapters but I doubt they get that far. I’m pretty sure, unless it’s really dire, that editors read whole short stories. What are you working on at the moment / next? Lesley: I’m working on the second after Dumpster Dying. I also have a traditional mystery (no humour in it) which I began several years ago. If I don’t do it soon, my obituary will appear before the murderer has the chance to bump off the victim. Morgen: Oh let’s hope for a few years yet – I do wonder whether I’ll get to write everything I have ideas for and I’m only 43… (er, 44 pretty much). Do you manage to write every day? What’s the most you’ve written in a day? Lesley: There are very few days when I do not write. I can write a chapter or two if someone else feeds the cats. Morgen: That’s a neat plan – anyone up for job as dog feeder? 🙂 What is your opinion of writer’s block? Do you ever suffer from it? If so, how do you ‘cure’ it? Lesley: I’ve never had it. It seems that once I started writing, I’m trying to get everything out that’s percolating around in my head. Of course, I have the advantage of having had a very odd childhood with a sane father and a bunch of crazy lady relatives. Good stuff to use. Morgen: Sounds wonderful… well, wonderfully odd. I’m pretty lucky with the writer’s block (on the rare occasion I get stuck, I leave it and do something else then return and pick up where I left off – there’s very little, unless it’s terrible, that can’t be finished). Do you plot your stories or do you just get an idea and run with it? Lesley: That’s a great way to put it. I’ve always said I plot by the seat of my pants, but you said it well—I just run with it. Morgen: Thanks, me too. 🙂 Do you have a method for creating your characters, their names and what do you think makes them believable? Lesley: My characters emerge from a compilation of personality characters, emotions, attitudes, and behaviors I’ve observed in people, then put together in an unique way. I’ll take a hair color from one person, a way of speaking from another, a taste for glitzy clothes from someone I’ve seen dress bohemian, bad breath from someone I’ve backed away from, and shake them all together like a bartender does a martini to make a character. I build on that concoction. Lesley: As for character names, they seem to come to me. For example, I had to change a name because I had too many characters with a name beginning with “J”. Yet I still think of that renamed character as “Jay”. Morgen: I’d say it’s OK if you have Justin and Jack because the main sounds are different but yes, easiest to avoid repetition. I’m currently fixated on the name Elliot so almost every story has an Elliot or a ____ Elliot; the joy of it being a first and surname. Who is your first reader – who do you first show your work to? Lesley: My writing critique partner sees my first work. Morgen: Aren’t they great? Time allowing my writing group hears the majority but some just goes off to my editor, Rachel. Speaking of which do you do a lot of editing or do you find that as time goes on your writing is more fully-formed? Lesley: I edit and edit. The ideas come fast enough that I want to get them down before they disappear and often they need to be reworked, written better. Morgen: And what’s your creative process like? What happens before sitting down to write? Lesley: Sometimes I spend time thinking about what I’m going to write, but I often create as I go along. Often I have the characters, an event, and the plot comes to me in the early morning hours. It wakes me up and keeps me up as I play around with it. I crate and plot every morning when the cowboy and I take a walk. Morgen: Now that’s a lovely image. 🙂 Do you write on paper or do you prefer a computer? Morgen: It’s that flat white stuff that they used to print books with. 🙂 What sort of music do you listen to when you write? Lesley: Sometimes classical or jazz. Or I listen to the air conditioner which is so loud I can’t hear the music playing. Morgen: Oh dear. We tend not to have air conditioning in the UK as it doesn’t often get that hot. What point of view do you find most to your liking: first person or third person? Lesley: I prefer first person. Because I don’t have to worry about head hopping or POV issues. Dumpster Dying is written in third person. Don’t ask me why, please. It just came out that way. Morgen: OK I won’t. Why… only kidding. 🙂 Do you use prologues / epilogues? What do you think of the use of them? Lesley: I use neither. I don’t think I know how to use them effectively enough to do it. Morgen: I thought that until I changed a chapter 1 to a prologue but it’s not gone to Rachel yet so it may well end up reverting. Do you have pieces of work that you think will never see light of day? Lesley: I know writers talk about that drawer where their first manuscript resides, but I keep revisiting earlier manuscripts and reworking them. Morgen: Unless you’ve such a large back catalogue that you won’t have time, it makes sense to because you’ve practiced since you wrote it and will see what’s fixable. What’s your favourite / least favourite aspect of your writing life? Lesley: Like all writers, I hate the business side of writing. The promoting, marketing, and publicity work in which, according to the best advice, you must be able to promote yourself at every opportunity but appear not to doing so. You must be blatantly coy about your work. How to do that? I have a cat who is an expert at it. He aggressively approaches my chair, but from behind and looks at me with beseeching eyes. I’m trying to work this into my marketing plan. Morgen: If only they could talk, he could do it for you. If anything, what has been your biggest surprise about writing? Lesley: It still continues to be fun even though the industry tries to convince the writer that it should simply be a business. The federal and state governments are complicit in trying to foist this view on me. They expect me to keep records and pay taxes as if I was a founding member of the chamber of commerce. Morgen: Which would have been useful as you’d know everyone there is to know… locally anyway. What advice would you give aspiring writers? Lesley: Write, write, write, and don’t lose your sense of humour. Morgen: Absolutely, especially when writing comedy. 🙂 What do you like to read? Lesley: Mysteries, of course. I read Elizabeth George, P. D. James, Robert Parker, and my fellow authors at Oak Tree Press and Mainly Murder Press. Morgen: Ah Oak Tree Press, a name I’m seeing a lot in these interviews; they’re clearly a popular company. 🙂 In which country are you based and do you find this a help or hindrance with letting people know about your work? Lesley: I’m in the United States and have always been here, so I can’t say if this is a help or a hindrance to getting the word out on my work. I suspect it is a help, but the playing field has been levelled with the internet and promotion through the use of it. Morgen: It has, I’d agree. Are you on any forums or networking sites? If so, how invaluable do you find them? Lesley: I’m on the usual sites, but can’t say how valuable they are with any concrete data from my book sales. I’m too new to publishing and began building my career last year. I think many authors are too impatient and don’t understand how a reputation is built. It takes years. Morgen: I’m newer, August 2010 for the podcast, Twitter and Facebook but late March 2011 for this blog and LinkedIn so still feel that I’m finding my feet there really. Where can we find out about you and your work? Lesley: Go to my website http://www.lesleydiehl.com or find me on my blog http://www.anotherdraught.blogspot.com. My books are available from Amazon, Barnes and Noble and UntreedReads as well as from my publishers http://www.oaktreebooks.com and http://www.mainlymurderpress.com. Look for my short stories (Murder with All the Trimmings and Mother Gets a Lift on Amazon also and also from http://www.Untreedreads.com. Morgen: Wow, that’s prolific. 🙂 What do you think the future holds for a writer? Lesley: Perhaps the book bubble will burst as some predict, but not for awhile. The near future is owned by those writers who write well, promote themselves, and continue to produce work on a consistently excellent basis. Morgen: And have time to do all that. I think it’s just perseverance… just keep plugging away, which if you enjoy what you’re doing is no real hardship. Is there anything else you’d like to mention? Lesley: I’m having a great time. It’s as if I have been preparing for this all my life. I wish I had nine lives like a cat. I’d probably do something different in each one of them. Morgen: That’s great to hear, and how I feel although I think in my other lives I would have started writing much earlier. Would you like to include an excerpt of your writing? Lesley: This excerpt is from Dumpster Dying. My protagonist is taken fishing by a fellow employee and what ends up on her line isn’t something you’d fry up for dinner. Morgen: I like the sound of that. Emily did what he suggested but the line didn’t move. “How big is this damn fish?” she asked. “I can hardly pull him toward the boat.” Emily tugged harder and kept the line taut. To her delight, she saw a shadow under water and then it broke the surface alongside the boat. “Must be a big bass,” said Donald. He got out of his seat and worked his way back to where Emily was sitting. Lesley retired from her life as a professor of psychology and reclaimed her country roots by moving to a small cottage in the Butternut River Valley in upstate New York. In the winter she migrates to old Florida—cowboys, scrub palmetto, and open fields of grazing cattle, a place where spurs still jingle in the post office. Back north, she devotes her afternoons to writing and, when the sun sets, relaxing on the bank of her trout stream, sipping tea or a local microbrew. ANGEL SLEUTH: Kaitlin Singer needs time off—from a philandering husband, from a writing career stalled on a buzzard as a main character, and from the stash of chocolate in her lingerie drawer. Her decision to return to her childhood home might seem like the perfect way to get her life back together were it not for her mother foisting two visitors on her, guests who claim to be guardian angels. Perhaps not all is lost, for the angels might just be the companions she needs to help her solve the murder of a local newspaper columnist. To uncover clues to the crime, Kaitlin takes over the dead woman’s work, writing the column as well as volunteering in the senior center, moves which put her in the path of the killer. She and her guests will need assistance from a pot-bellied pig and some pool skills to bring the murderer down. 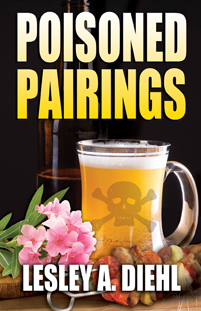 POISONED PAIRINGS: A student helping set up for a beer and food pairings event in Hera Knightsbridge’s microbrewery dies there under suspicious circumstances. At first the death looks like a suicide, but the medical examiner determines it is murder, and Hera and her lover, Deputy Sheriff Jake Ryan again find themselves partners in searching for the killer. Not only does murder threaten the community, but something more explosive has come to the valley—hydraulic fracturing or fracking, a controversial gas drilling technique whose proponents say can take the poor families of the region out of debt. Hera and her fellow brewers are convinced it will contaminate the water supply, as it had in other places, and change forever the pristine beauty of the valley. Connections among the student, the family of a dead brewer, a religious leader and the gas companies lead Hera and Jake into a maze of confusing and conflicting clues. Before the two can unravel the case’s tangled threads, Jake is called away to another job, leaving Hera alone to uncover the identity of the killer before she becomes the next victim. I think you’ve had great, and varied, success already, but I wish you (and your agent) the best of luck shopping your book. I’m sure the chocolate will help–one of you 🙂 Thanks for the interview. Wonderful interview, Lesley and Morgen. Good questions and answers. Lesley, I’ve read some of your work and I can honestly say I’ll be looking for your next book. Both your interview and your writing are refreshing and entertaining. I enjoyed this interview. It’s always fun to learn what goes into the development of a mystery writer. Lesley, I look forward to reading your books. Thanks all of you for reading and commenting on the interview. I love Morgen’s questions, don’t you?